Thinking Out Loud In Sturbridge: Another Major Issue Overcome. Whew. 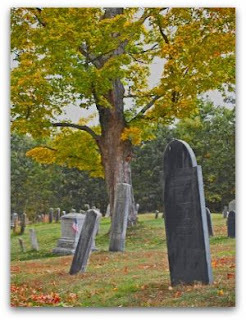 This past Monday the Board of Selectmen voted 3-1 for the acceptance of both flat memorials, and vertical memorials at the North Cemetery. Believe it or not, this topic made the papers not only before the vote, but was reported on in great detail after the vote as well. Why is this issue getting so much press? Seems like a simple enough, everyday type of small town thing that gets brought up, voted on and that's it. Apparently not. Seems some time ago the town told the residents of Jamieson Road that flat, horizontal headstones would be the only stone allowed in the future in the growing cemetery. This would serve a couple of purposes. One, it would make maintenance easier when mowing the grass, and two, it would be easier on the eye. The section near Jamieson wouldn't look like a cemetery anymore for the residents. I can see both sides in this one. I lived on Jamieson Road for awhile, and wandered through that cemetery many times. I could see it from my side yard, but it wasn't outside my front window, either. I understand that having a cemetery outside ones bay window is not the most scenic vista, but the cemetery has been there for 200 years, and the only things that have changed are the houses that were built near it, and the growth of the cemetery over the years. And, I can understand the sole vote against vertical, or raised stones, especially if it will affect your sisters view. I figure I'd do the same. If you buy a house on the water, you're gonna get wet once in awhile. Same with buying a home near a cemetery, if you see headstones when you bought the house, you're gonna see even more of them for years to come. I said I could see both sides of this, and I do. If the town had made a promise to the residents that only horizontal stones would be accepted, then that issue should have come up for a vote at the time. If it did, honor it. If it was one of those off the cuff remarks made a board meeting, then there is little we can do to enforce it. Still, it's a broken promise. Anyway, the vote has been taken. We can bury it now. Photo: Vertical headstones in the old section of the North Cemetery. That is the question IF the town made a promise and no one had any proof the town made such a promise. If a town official made such a promise they should be called on it. So far no one produced proof such a promise was made and Scott dismissed the reason was to save maintance dollars even though Greg Morse used that as his reason for wanting flat head stones. the selectman that voted against the big grave stones has a sister involved in this? was she one of the one that wanted the flat ones? I guess I can see why he voted that way, too. Maybe making the stone wall go in front of the street would block them and along the yards, too.